“The warrior-King, Makhado Tshilwavhusiku Ramabulana’s exploits in defence of our land, our dignity and our well being will forever remain etched in our proud history of resistance to colonialism’. Former President Nelson Mandela. “I am the grandchild of the warrior men and women that Hintsa and Sekhukhune led, the patriots that Cetshwayo and Mphephu took to battle, the soldiers Moshoeshoe and Ngungunyane taught never to dishonour the cause of freedom”. Former President Thabo Mbeki. Munzhedzi Mpofu later relocated from Dzata to Songozwi. This was because Songozwi was strategically situated, as one could see the whole kingdom from the summit. Tshivhase once again mobilized an army and tried to invade Munzhedzi Mpofu at Songozwi. The battle was fought along the banks of a river that became red with blood. It was consequently known as Khwivhila, which means red. Tshivhase lost the battle. Having been defeated twice, first at Dzata and then at Khwivhila, Tshivhase fled. Munzhedzi Mpofu remained king of Vhavenda. Raluswielo, Thohoyandou’s brother, also known as Tshivhasa Midiyavhathu, settled as Ha-Tshivhasa. Mpofu is said to have died in 1791. A war of succession ensued between Rasithu and Ramavhoya. Rasithu was defeated in the war of succession and he fled to Moletjie, Botlokwa. The Batlokwa gave Rasithu the name of Ramapulana (he who comes with the rain). The nickname Ramapulana later became Ramabulana. Rasithu became the King and was given the title of Ramabulana. King Ramabulana ruled until his death in 1864. He was very old when he died, and he had already allowed his eldest son, Davhana, to be in charge. King Ramabulana was the last Vhavenda King to be buried in a cave. He was buried at Vuvha, and the cave where he was laid to rest is up to this day regarded as sacred. It is guarded by the Khosi of Vuvha, Mulambilu Mphephu. and Makhado were the sons of King Ramabulana. Davhana was the eldest son and should have taken over the reign. But he was disliked by the Royal Council and chiefs due to the fact that he was seen as a dictator. Most members of the Royal Council preferred Makhado, Ramabulana’s youngest son. Makhado was considered to be brave and was the most popular among his brothers. Makhado’s popularity and bravery, and the assistance he got from Makhadzi Nyakhulu led to his assumption of the Ramabulana kingship. The Boers, who settled in the land of Ramabulana in the mid 1800s, had become embroiled in internal Vhavenda dynastic struggles. They opposed the succession of Makhado and supported Davhana who was the rival claimant, in an endeavour to stamp their authority over Vhavenda. But they failed. King Makhado gave the land of Vari to his brother, Nthabalala. Vari is known today as Ha-Nthabalala (the land of Nthabalala). Rasikhuthuma was given the land of Tshitungulu (Ha-Masakona) in the Luvuvhu river valley. Davhana was given Luvhola, Mpheni and Nngwekhulu. These areas are known collectively as Ha-Davhana. King Makhado’s palace was at Luatame on Mount Songozwi (Hanglip). Sheer cliffs fortified the palace of one of the African liberation struggle heroes. The cattle post was at Tshirululuni, where Makhado town stands. Luatame offered King Makhado the view of all those approaching, including enemies. 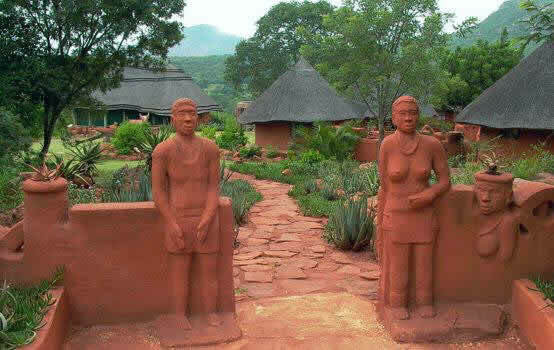 Luatame and Tshirululuni also provided the Ramabulana capital with a home rich with wild fruits, good pasture for their many cattle, large tracts of land for ploughing and a place free of mosquitoes that plagued many Venda areas in summer. Makhado defended Vhavenda territory with his battalions. The Manenu battalion, which was the strongest, was situated at Tshianane, north of Soutpansberg. The warriors of Manenu were popular for their fighting prowess. They used spears, battle axes, bows and arrows as their weapons. The shield was the symbol of this battalion, symbolising the safeguarding of their kingdom and Vhavenda. The Maunavhathu battalion was situated at Tshino where the South African Army’s Maunavhathu Airforce Base is found. The Maunavhathu warriors were known for their fearlessness and ruthlessness. The Mavhoi was a senior battalion. It formed part of the security at King Makhado’s kraal. This battalion collected all the spears from the defeated enemies. Makhado’s father, Ravele, had allowed white settlers to stay at Schoemansdal in 1858. Schoemansdal was the northernmost part of white encroachment into the rest of South Africa. It was a hive of activity, the centre of business – where elephant tusks, skins from leopard and lion, dried meat and teak wood were exchanged for gold and other commodities. Trade in ivory and skins constituted two-thirds of the £150 000 derived from business in one year. Of that amount, £30 000 was from ivory. As time went on, settlers wanted more and more land. They also wanted Vhavenda, including royal princes, to work for them for free. They wanted tax and to map out where King Makhado’s area would be – a reserve designating where his jurisdiction would begin and end. King Makhado have none of it. He told the whites to get off and that he did not recognise their rule over Vhavenda. One day King Makhado’s army commander, Funyufunyu, visited his brother who was working for the Boers at Schoemansdal. Funyufunyu witnessed how the Boers were ill-treating Vhavenda at Schoemansdal. The following day, 13 July 1867, the drum was beaten and Venda soldiers assembled for the attack. They went down and killed everybody there. The only survivors were two hunters who had gone out. They raced away towards the south, where they got help to go back and claim their dead. The bodies were taken to Soekmekaar and many went there to look for their relatives – and the name Soekmekaar (looking for one another) came from that. The destruction of Schoemansdal meant that the regime in Tshwane had lost its hold on Venda. The whites settled in Marabastad, outside Polokwane and later established the town of Polokwane. The settlers then tried many tricks to get King Makhado on their side. On 20 November 1869, Kruger, RA van Nispen and Commandant DB Snyman assembled 80 Vhavenda chiefs and headmen to pledge their loyalty to the white regime. King Makhado boycotted the meeting and refused to abide by its decree. In 1887, General Piet Joubert was sent to try and convince Makhado that his land was too big for the number of people he ruled. King Makhado rejected this. He said his people would not be counted for a census and that his land did not need to be measured as he knew where it started and ended. The settlers, together with Tsonga speaking men aligned to a Portuguese man called Joao Albasini, who was also a Native Commissioner, once more tried to fight King Makhado. But they could not dislodge him after several fights. This earned King Makhado the nickname “Bull of the North” and the praise name “Tshilwavhusiku tsha Ramabulana” (the night fighter of Ramabulana), because he attacked at night with men who knew the area intimately. King Makhado died of suspected poisoning (poisoned at a shop owned by John Cooksley) in September 1895. His sons who were eligible for the crown were Alilali Tshilamulela, Maemu Malise, Sinthumule and Kutama. Alilali Tshilamulela, the eldest son, was working at the diamond mines in Kimberley at the time of King Makhado’s death. Sinthumule was in Bulawayo, Zimbabwe. Sinthumule came back and was dismayed that Maemu Malise had been crowned the new king of Ha-Ramabulana. Sinthumule sent messengers to Kimberley to notify Alilali Tshilamulela that King Makhado had passed on and that Maemu Malise was the new king. Sinthumule and Alilali Tshilamulela plotted to remove Maemu Malise from the throne. Alilali Tshilamulela came back from Kimberley and had a secret rendezvous with Sinthumule at Luvhivhini village (Maebani), Ha-Kutama. They later attacked Maemu Malise and removed him from Songozwi. Alilali Tshilamulela was crowned the new king of Ha-Ramabulana and was given the title of Mphephu. Maemu was resettled at Ha-Maemu and paid tribute to King Mphephu. Sinthumule became the Prime Minister during King Mphephu’s reign. Sinthumule settled at Tshiozwi and ruled the land known today as Ha-Sinthumule. Ha-Sinthumule consisted of areas such as Tshifhefhe and Ha-Vhangani. Kutama was placed at Tshikwarani and ruled over the land known today as Ha-Kutama. The Boers took over Luatame as Mphephu fled to Zimbabwe. A town was established on 22 February 1899 at Tshirululuni, and Tshirululuni was renamed louis trichardt. Sinthumule was crowned the King of Ha-Ramabulana by the Boers, but his rule was not recognised by Vhavenda. They continued to pay tribute to King Mphephu in exile through Rambiyana and Ravele Matsheketsheke. The Boers could not, however, establish a permanent presence at Songozwi since they had to engage in a bloody war with the English in the South African war (the Anglo-Boer war) which broke out in 1899. Vhavenda of Ha-Ramabulana sided with the English and burnt the town of louis trichardt. The Boers were defeated in the South African war and surrendered in 1902. King Mphephu II was succeeded by his son, Ramaano Patrick Mphephu Ramabulana who ruled from 1949 to 1988. He was crowned King Mphephu III. He was, however, referred to as Paramount Chief since apartheid South Africa did not want to have African kings referred to as kings. King Mphephu III broke with the proud Ramabulana tradition of resistance to colonialism and apartheid. He collaborated with the apartheid rulers and got involved in Bantustan politics. It is important, however, to state that King Mphephu III was forced by the Boers to collaborate with the apartheid system. He initially resisted collaboration, but changed his mind in the early 1970s after the Boers made him believe that Thovhele Tshivhase of Ha-Tshivhasa was more than willing to collaborate. Fearing that he would be deposed and dethroned by the Boers, as they were doing to chiefs and kings who resisted the apartheid system throughout South Africa, King Mphephu III succumbed under pressure from the Boers. King Mphephu III became the Chief Minister of Vendaland in 1973. He later followed in the footsteps of other puppets of the apartheid regime, Kaizer Matanzima of the Transkei, and Lucas Mangope of Bophuthatswana, and opted for nominal independence. Venda became a ‘republic’ in 1979 with King Mphephu III as the ‘President’. The capital of the ‘Republic of Venda’ was Thohoyandou, a town founded by Mphephu III. King Mphephu III died of suspected poisoning in April 1988. He was succeeded by his son Tshimangadzo, as king of Ha-Ramabulana. King Mphephu III’s son, Tshimangadzo, was crowned King Dimbanyika Thohoyandou Ramabulana II in 1994. The Ramushwana military government in Venda had already abolished the position of Khosikhulu (King). It is believed that Ramushwana, through the Mushasha Commission, abolished the position of Khosikhulu because the Constitution of the ‘Republic of Venda’ stated that the Head of State was the Paramount Chief / King of Venda. Ramushwana and his military junta did not, therefore, want to be accountable to the King. Dimbanyika Thohoyandou Ramabulana II was referred to as Thovhele (King) by his subjects even though the government classified him as Khosi (Senior Chief). It is alleged that Dimbanyika Thohoyandou Ramabulana II was a reckless King who showed scant respect for tradition and protocol and had no respect for all his subjects, including elders. His detractors claim that he did not listen to the Royal Council. But his defenders argue that Dimbanyika Thohoyandou Ramabulana II did not have a royal council and that he consulted with only two people, his Ndumi and Khadzi. They argue that the absence of a royal council led to him taking and implementing wrong decisions. Dimbanyika Thohoyandou Ramabulana II died in a car accident in December 1997, leaving a baby girl as the only heir to the throne. His younger brother, Toni, was installed as the new King of Ha-Ramabulana and was given the title of King Mphephu Ramabulana. He was crowned by former president Nelson Mandela in 1998. King Toni Mphephu Ramabulana is in the process of transforming the institution of traditional leadership to enable it to be more responsive to today’s socio-economic challenges that continue to confront the Venda people. This is being done by facilitating and ensuring good relationships between Vhamusanda (junior chiefs), Mahosi (senior chiefs), civic organisations and the people. He also encourages investors to invest within the Makhado local municipality (Ha-Ramabulana). This is done to assist in ensuring that employment opportunities are created. On this all important task he is assisted by his Ndumi (Deputy King) Mbulaheni Charles Mphephu, Vhavenda Vho-David Mphephu, Mahosi of Ha-Ramabulana, elders, advisors, and other members of the Ramabulana Royal Council. The Ramabulana Royal Family registered their claim in 1998 on land consisting of eight farms surrounding Songozwi village, some few kilometers outside Makhado. Songozwi houses the Royal Court of the Ramabulana Royal House and the burial site of the Ramabulana Kings, and Sinthumule and Kutama Chiefs. In 2004 the Land Claims Commission found the claim to be valid and published it in the Gazette. The required 30 days for anyone contesting a claim to come forward came and went but the claim remains to be finalised. The land of these communities was turned into farms and given European names. Ha-Maemu became Fort Edward, while the Luvuvhu river valley was corrupted into Levubu. Ha-Madzhie, Ha-Lishivha, and Ha-Tshivhula consist of Mapungubwe and the areas known today as Waterport and Alldays. The Lishivha, Tshivhula, Mulambwane and Matshete communities have lodged their claims with the Land Claims Commission, and their claim has been verified. It, however, looks like that the claim will take longer to settle since the four communities’ claims overlap and they cannot agree on the boundaries. They have all staked a claim on land where the Venetia diamond mine and Mapungubwe are situated. The Funyufunyu, Maphaha (Vhulorwa), Phawe, Magoni, Lunoni, and La Ndou communities have also lodged their claims with the Land Claims Commission, and their claims have also been verified. The Ramalamula and Liswoga were relocated to Mamvuka, Tshirolwe, Tshikuwi, Maranikhwe, and Ha-Matsa. The Liswoga community has, however, received their land back. The Ramalamula land claim has not yet been settled. The area known today as Wylliesport, where the tunnels are found, is Manaledzi and is found at Khavhambe, commonly known as Khavhambe Ha-Ramalamula. Manaledzi, the only passage through the Soutpansberg Mountains until the building of the tunnels in 1961, was renamed Wylliesport after Lieutenant CH Wiley, engineer of the road (N1 between Makhado and Musina) project. Ha-Manavhela was renamed Ben Lavin Nature Resort. The Manavhela/Ramovha community was evicted from their land in the 1960s and resettled at Ha-Kutama. Their new dry and rocky village was also named Ha-Manavhela. Other families were taken to Tshimbupfe and the new village was also named Ha-Manavhela. Other families were taken to a place known today as Ha-Mufeba (named after the name of one of the Manavhela chiefs). Ha-Manavhela was given to a veteran of World War I, Ben Lavin. It was turned into a farm and renamed Ben Lavin. Ben Lavin’s widow later donated the land as a game farm to the non-profit Wildlife and Environment Society of South Africa (WESSA) in 1976. The Manavhela/Ramovha community lodged their claim with the Land Claims Commission in the 1990s. Their claim was settled in April 2002, with 2000 community members from 700 households becoming beneficiaries on a land comprising 2611 hectares. The negotiated joint management agreement, between the Manavhela community and WESSA, regarding the game reserve resulted in the name being changed to Manavhela Reserve. Luonde, the land of the Mukwevho clan, was renamed Piesanghoek. Ha-Ratombo remained Ha-Ratombo but, just like the other areas, was declared a “white area”. Ha-Ravele was divided into different farms known as Barotta, Klein Australia, and Entabeni. The lands of Davhana, Mashau, Matidza, Rasikhuthuma, and Madzivhandila became known as Levubu, a corruption of the river Luvuvhu. Tshipise tsha Dondwe (Dondwe Hot Spring), which was ruled by Khosi Nedondwe, was declared a “white area”, and simply referred to as Tshipise. The people of Tshipise were forcibly relocated to Folovhodwe, Dzimauli. A nature resort known as Tshipise was established and was an exclusive resort for whites. Today, Tshipise is no longer a colonial outpost. The community of Dondwe has also registered their claim with the Land Claims Commission. 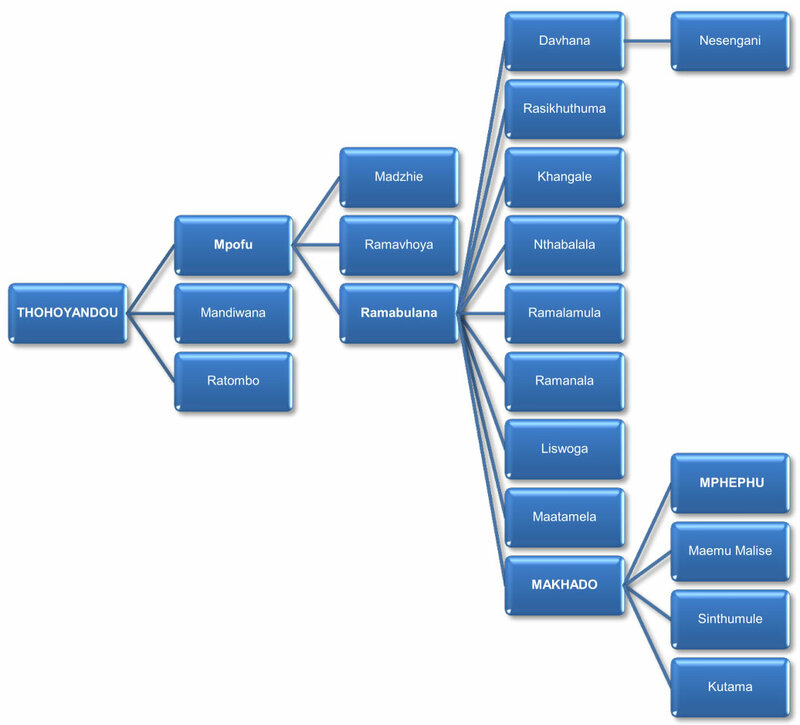 The Makatu, Mukwevho, Maemu, Mashau, Ravele, Rasikhuthuma, Ratombo, and Madzivhandila have also registered their claim. The chiefdoms are ruled by Mahosi (chiefs) who pay tribute to the Mphephu Ramabulana king. Mahosi are assisted by Vhamusanda/Magota (junior chiefs).